1 What is the Suzuki method ? 2 How do I know if a teacher is a genuine Suzuki teacher ? 3 At what age should my child start to learn ? 4 Can a child learn two instruments at the same time ? 5 Is there an opportunity for me to witness the Suzuki method in action before committing to lessons ? 6 What does it mean in practical terms for me to have a child taught this way ? 12 I am not a musician and do not read music, how do I manage my child’s practise? 13 How much will lessons cost for a term? 14 Do children take Associated Board Grade exams? 15 Why, when my child starts lessons, do I have to become a member of the London Suzuki Group and the British Suzuki Institute? What is the relationship between these organisations and others that I hear about? 16 Can my child, who is not Suzuki taught, join the Saturday morning group lessons to have the experience of ensemble playing? What is the Suzuki method ? A belief that every child can learn. You are never too old, but an early start is a great help! Learn from observation – of group classes, your peers classes. ‘Mother-tongue’ method. The child learns music from a very early age in the same way that the child learns his own language. This involves listening to others in group lessons and concerts. Daily listening to recordings of music that the child will play. Teaching in a mixture of private one-to-one lessons and group lessons. Complete mastery of a piece, and constant review. As an extension of this use of old, well learnt repertoire to reinforce later teaching points. Positive feedback. Always note what is good. Teachers who are both instrumentalists of a high standard AND trained to teach. The method was developed by Shinichi Suzuki and was refined by him over his lifetime. He believed that children could learn an instrument from an early age (three upwards) in the same way that they learned language. This belief has been described as the “mother tongue method”. In other words the process of constant repetition and absorption by which language is learnt could be imitated in the teaching of a musical instrument. He also made learning fun. Although he himself was a violinist and the method is associated predominantly with the violin it is in fact a method which can be applied to any instrument, and in the UK, there are Suzuki teachers for viola, cello, flute, piano and recorder. Suzuki required the presence of a parent during the lesson so that they could act as a facilitator for their child at practise time. A step-by-step teaching process using graded repertoire books with accompanying recordings identical for Suzuki pupils all over the world ensures a comprehensive teaching process and a common repertoire. The cornerstones of the method are listening and observation. Pupils and parents listen to the recording of a piece in advance of learning it. This is the key to producing a good sound on any instrument. All pieces are learnt from memory so that the pupil, having mastered the physical requirements of a piece, can concentrate on quality of sound. This does not mean that Suzuki pupils learn only by ear. They learn to read notation from day one. Memorising pieces gives pupils a confidence in the geography of their instrument so that sight-reading becomes easy. For very young children who have not learned to read language sight-reading is introduced later. Another very important feature of the Suzuki method is that pupils only perform pieces, either as a solo or in a group, when they have progressed beyond the technique demanded by those pieces. This means that pupils do not face the challenge of performing when they are only just getting to grips with new aspects of technique. How do I know if a teacher is a genuine Suzuki teacher ? A Suzuki teacher in the UK will have undergone specialist post-graduate training accredited by the European Suzuki Association. They will also be a member of their national association, in the UK, the British Suzuki Institute. The Suzuki name is a trademark that is protected world-wide and no-one may promote themselves as a Suzuki teacher unless they fulfil both criteria above. At what age should my child start to learn ? Ideally, at three or four years old but many start later. How do I choose an instrument ? In the UK there are Suzuki teachers in five instruments but they are spread out across the country. In London, violin, viola, cello and piano are taught. Can a child learn two instruments at the same time ? Is there an opportunity for me to witness the Suzuki method in action before committing to lessons ? Yes, you can come to St Clements and St James’ School, London W11 4PG on any of the six Saturday mornings during term time to observe group teaching. Please read this page and send this form to Jillian Leddra (address on form). What does it mean in practical terms for me to have a child taught this way ? The Suzuki method is about enjoying music for life. Individual lessons, practice and group lessons, rehearsals, performing and concerts are all about creating and sharing music. If you become a Suzuki parent then you must take the long view for your child that you do anyway. This means that learning an instrument is part of the fabric of family life. It is not an appointment in your diary for an activity in which your involvement is confined simply to driving to and from lessons. If your child becomes a pupil of the BSG then it will be assumed that they will take Grade 8 before they leave school. This means that your child, starting at three, will be learning for ten or more years and you will have been a figure of crucial importance in that learning process together your teacher. This is the triangular relationship at the heart of Suzuki learning. If your child becomes a pupil of one of the teachers in the Bayswater Suzuki Group then you will automatically be committing to a private lesson during the week and six Saturday mornings during term time of ensemble playing, chamber music, singing and musicianship, You will not be able to commit simply to private lessons. 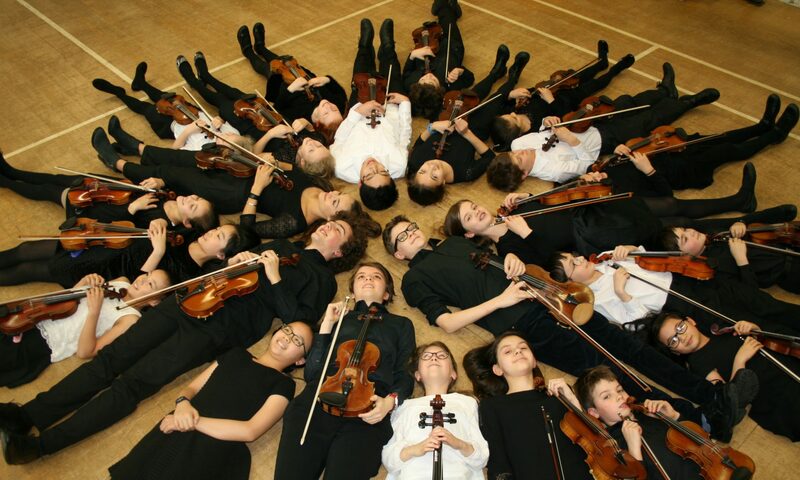 Group lessons are an extremely important part of learning and performing an instrument – and are really fun! It should be noted that both the group lessons and the private lessons follow the English school terms and holidays. For the group classes there are generally four classes before half term, a break of two weeks and then two groups after half term. — For private pupils the spring and summer terms with a *Pizza Party*week, where four solo concerts are held at four families’ houses over four days. Each pupil performs a solo piece with piano . — All solo performances are always from memory and we ask that everyone stays to watch to the end of the concert. — There are also concert opportunities at the London Suzuki Group recital series at the Royal Academy of Music on two Sundays a term. — There is an informal Groups concert for all pupils at St Clement’s and St James’ School on the last Saturday of the Spring & Summer terms, when pieces learnt at the group sessions are performed. All parents are invited to watch. — The winter term ends with a formal concert in the evening usually at St Peter’s church, Notting Hill. The programme of this concert will include group pieces and solos only some of which will be from the Suzuki repertoire. — The concert is programmed so that very young children play in the first half of the concert and can leave at the interval — but everyone is encourage to stay and listen if possible. We do ask parents not to bring infants. It ís very distracting for performers (anywhere!) when there is noise in the audience. The important social dimensions to all these activities support families in the ongoing learning process and bring pleasure to all. It is often these that help the parent at home supervising practise. And this is not always easy! There is no question that the going sometimes gets tough for Suzuki parents as their children grow up and other interests compete for your and their attention. If your child has started at three or four by the time they are fourteen and fifteen practise is a very different matter. By this age, the teenager will be expected to practise by themselves and sport, socialising, academic work may all take up much more time than they did when they were three years old! You will always have to keep practise going during holiday times whether at home or abroad. That means the violin (viola, cello) goes on the plane/in the car/in the train, as hand luggage and comes out during the holiday wherever you are staying. Holiday work prepares pupils in the pieces they will be doing the following term. However, by the time you have a teenage Suzuki pupil they are also able to go, unaccompanied, to, say, the London Suzuki Group’s, summer course at Bryanston. Here, they can stay with all the other teenagers in the all-teenage house and have a great time making music and socialising. There also other Suzuki courses in the UK, and indeed, abroad, as well as music courses run by others which offer many opportunities for Suzuki pupils. Jillian also runs two summer courses in July: the Chamber Music course is for Book 5 (or Grade 5) players and above, and the Summer Exgravaganza, where participants put on a show at the end of five full days. We also welcome non-Suzuki participants, playing any instrument, to these courses. I am not a musician and do not read music, how do I manage my child’s practise? Bear in mind that your will be attending all your child’s lessons, and so effectively learning alongside the child. In the same way that the child does not need any prior knowledge, nor do you. The mail order bookshop of the British Suzuki Institute in London W14 has the largest stock of Suzuki and related books and materials in Europe. There are many books to help parents and children in addition, of course, to the core repertoire books and recordings. And in order for your child to get used to playing with a pianist the recordings all include a rendition of the piano part without violin (or cello or viola). How much will lessons cost for a term? Do children take Associated Board Grade exams? Each Suzuki teacher has their own policy. Jillian aims for all her pupils to take Grades 5 and 8 practical exams and Grade 5 theory. Why do I have to become a member of the London Suzuki Group and the British Suzuki Institute? What is the relationship between these organisations and others that I hear about? The British Suzuki Institute is the national association representing all Suzuki teachers and their pupils in the UK. A mandatory subscription from teachers and their pupils payable to the BSI supports the Suzuki teacher-training programme in the UK as well as giving parents membership benefits of various kinds. One of the most relevant of these is that members receive, on average, a 13% discount on items from the BSI bookshop. In addition, many teachers round the country, either singly or with others, describe themselves and their pupils as groups simply to create group cohesion. Many of these do not have a formal constitution, but the few very large ones like the London Suzuki Group, whose London-wide membership is substantial, have constituted themselves as charitable trusts and also charge a subscription. This gives pupil members another raft of benefits including taking part in the main LSG concert in a London concert hall. For more information about these organisations click here. If your child becomes a pupil of any of the BSGís teachers you will pay an aggregated subscription direct to the LSG who will, in turn pay the British Suzuki Institute that part of the subscription owed to the BSI. Can my child, who is not Suzuki taught, join the Saturday morning group lessons to have the experience of ensemble playing? You must come and observe at least three group lessons on a Saturday before you start. You must discuss this decision with your teacher who must support it. If they are not willing to prepare the repertoire with your child then you will have to ensure that it is done another way. Suzuki pupils receive their group work at the end of the term preceding the term in which the work is to be performed. If and when you start, you will have to commit to all the six Saturdays and the concert like everyone else. Playing in a group does not mean that a pupil can rely on others to get everything right when they are not quite sure of a passage or two. Group players are all required to play at soloist level. You will have to pay your fee two weeks in advance of the start of term and, we regret, there are no refunds.